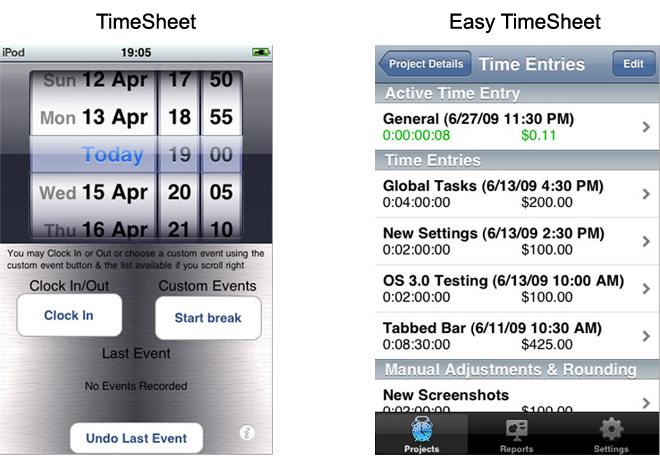 Home » Battle.app: Timesheets made easy! Continuing our recent string of new additions to our weblog, to constantly improve our services to the community, we are also introducing a new type of iPhone app reviews. On a weekly basis, we will be selecting two similar applications with arguably similar uses, but differing in just about every other aspect, from user friendliness and graphics, to simplicity and functionality. Besides from doing a review of both, we will be pitching them against each other in a VS style battle of who's your iPhone's must have. We of course understand that we cannot cover all applications that aim for a particular use, which we will call on you for your very own app suggestions. Please understand that we are not advocating any app over another by selecting only two out of the bunch, but for our particular purpose, we believe it is adequate for you to get an impression of what to look for in that specific kind of iPhone or iPod Touch application. 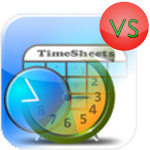 First up for this week, we've decided to offer you our very first VS on Battle.app: Timesheet vs. Easy Timesheet. While they are both aimed at keeping track of your time, how well it's managed and spent, there are notable differences in how they interact with the user. Timesheet from Jumping World Studios is designed with a simple goal in mind: keep track of your daily work hours, without the bells and whistles you'd encounter in a app that provides integrated solutions for small businesses. The app is designed to function like a Work Clock, where you're able to clock in when you get to work, clock out for breaks, clock back in and clock out at the end of the work day. The application is aimed specifically at individual employees that want an easier way to keep track of their own work hours and have their own records, making it simpler to fill in your weekly, bi-monthly or monthly time sheet with their employers. The app can keep score for the last 10 weeks of input times. Easy TimeSheet from Augustine Software is a porject-tracking iPhone app, where you can keep track on more than one project of all your billable hours, working similar to a digital time sheet. The app can keep track of every minute you've spent working on a client's project, providing you at the end with the final bill for that client. The app supports both real-time and after-the-fact time tracking, with easy to use pause and play buttons for each of your projects. Another important feature of this app is the ability to generate comprehensive reports at the end of the work day, and even email them directly to the client or partners. Taken together, the two iPhone app both provide a set of tools to help manage and track work time, but comparatively, we're looking at two distinct set of features. While Timesheet merely gives you the power to track time for work and generate a cumulative report for the time spent on the job, you have Easy TimeSheet that helps you manage several projects at the same time, with a larger set of options to generate the report at the end of the day. It is perhaps the main difference between the two apps. Going beyond core differences, Easy TimeSheet stands out for its functionality, while TimeSheet for its ease of use. With its simple screen and no fancy graphics, TimeSheet looks and works just like your basic clock-in / clock-out work clock, with no extra menus to define what project you're working on today. You also have the possibility to define special events, such as taking a break, vacation and even sick day. The app works perfectly for those of you who want to keep a check on the employer and his own time sheet and provide him with accurate information. The app however doesn't go above and beyond what you'd expect. But this is where Easy TimeSheet comes in. It provides more functionality to the end user. Define projects, hourly rates for each, with support for over 150 local currencies, and the ability to work on more than one project at a time. One thing that really make this app worthwhile is the ability to send your time sheet directly to the client's email address. This sharing option between employer and employee make Easy TimeSheet an application that is suitable for both a self-employed as well as an employer running a small business with just a few employees. You can sort projects in your list, password-protect them, start and pause time as you like and edit time spent on a project even after the project is completed. What is interesting to note however is that both apps are priced the same in the App Store at $2.99, making Easy TimeSheet worth the money over TimeSheet. Without the possibility to enter any type of hourly wage, no way to define projects or share time sheets between users, TimeSheet falls short of satisfying end user needs in a world in constant movement and development. Our clear winner in our first Battle.app is Easy TimeSheet. Your pick? Its not all about just timesheets made easy, its also about timesheet made it easy. yes, timesheets have made the complete timesheet filling, updating and approving task easier. Not just for the employee time clock, but for projects there are time billing softwares and project tracking softwares that made the complete project tracking and billing easier.